The pedestrian advocacy world has been buzzing over one graduate student's efforts to promote walking in North Carolina ever since the BBC featured the campaign in one of its Altered States segments this month. Working with a couple friends, Matt Tomasulo tagged utility poles around Raleigh with wayfinding signs touting walk times to popular destinations. The idea is that the signs will not only help visitors find their way around, but also remind everyone who hits the city streets how quick it can be to walk to a nearby destination instead of driving. Sadly, city regulations prohibit unsanctioned signs like these, so the signs were removed a few days ago--but Tomasulo remains positive, calling the campaign a "tremendous experience" and promising "more is yet to come." 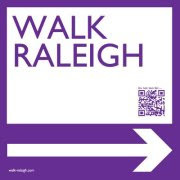 Raleigh seems to agree, and has asked Tomasulo to attend its next Bicycle and Pedestrian Advisory Commission meeting so that members can discuss ways to incorporate the Walk Raleigh signs into the city's official pedestrian planning efforts.